I'm always looking to for fun, purposeful activities to use when I have a few extra minutes! This activity includes music, movement, and letter recognition. Fill a box, bag, or any container you can find with letters. I used these felt letters I got from Target but you can use magnetic letters, letter tiles, or just write letters on small pieces of paper. 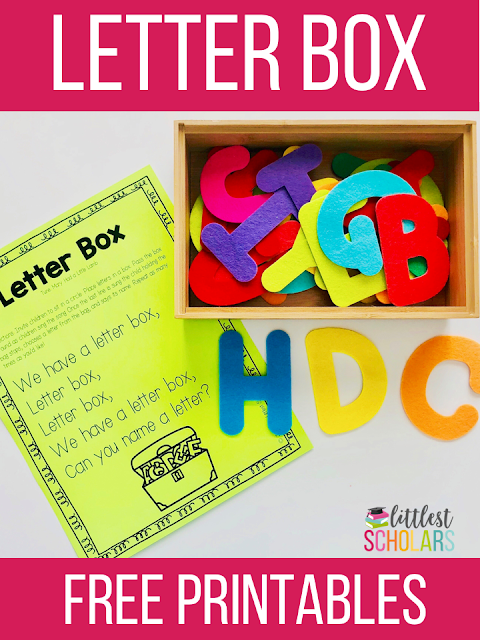 Have your little scholars sit or stand in a circle and pass the box of letters around as they sing the song. The child with the box of letters at the end of the song will choose a letter, show it to their classmates, and name it. You can repeat this as much as time allows! You can find lots more alphabet activities here. 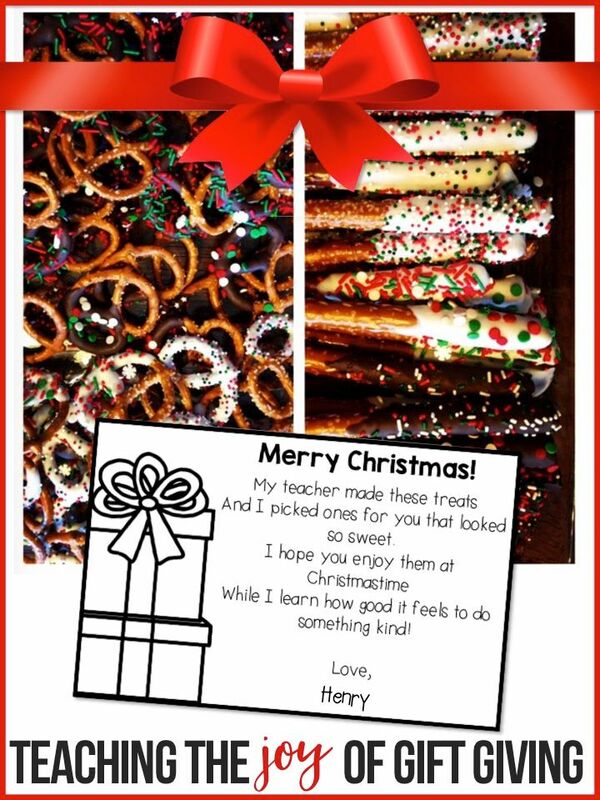 Download the free song and letter card printables here. 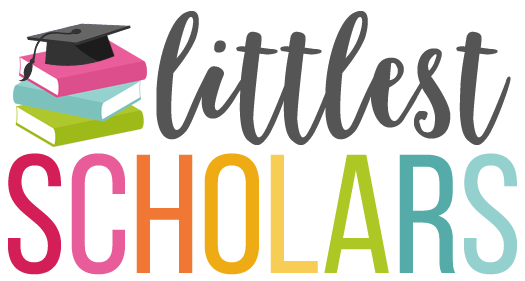 Join the conversation in the Teaching the Littlest Scholars Facebook group! The first days and weeks of school can be hectic! 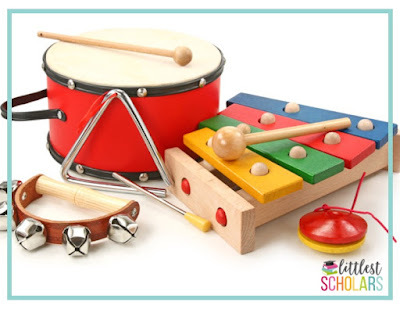 Use this tip to get your little scholars acquainted with their new classroom. 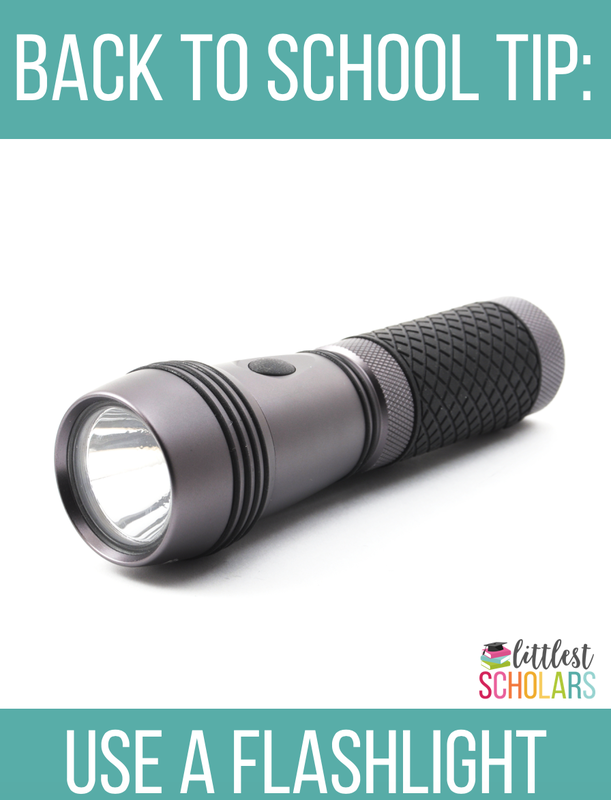 After you introduce new areas of the classroom, check for understanding by turning out the lights and giving one of your little scholars a flashlight. Ask them to shine the light on various places in the classroom. It's a fun way to get acquainted to their new surroundings! -Where do you sit on the rug? -Where do you hang up your backpack? -Where do we start to line up? -Where do you put trash? -Where do you get a pencil if you need one? What else can you spotlight in your classroom? Next up in this series is rhyme and alliteration! Before we dive in, let's talk about phonological awareness and how rhyme and alliteration fit in to the larger phonological awareness continuum of skills. Research suggests that phonemic awareness is the single best predictor of reading success. 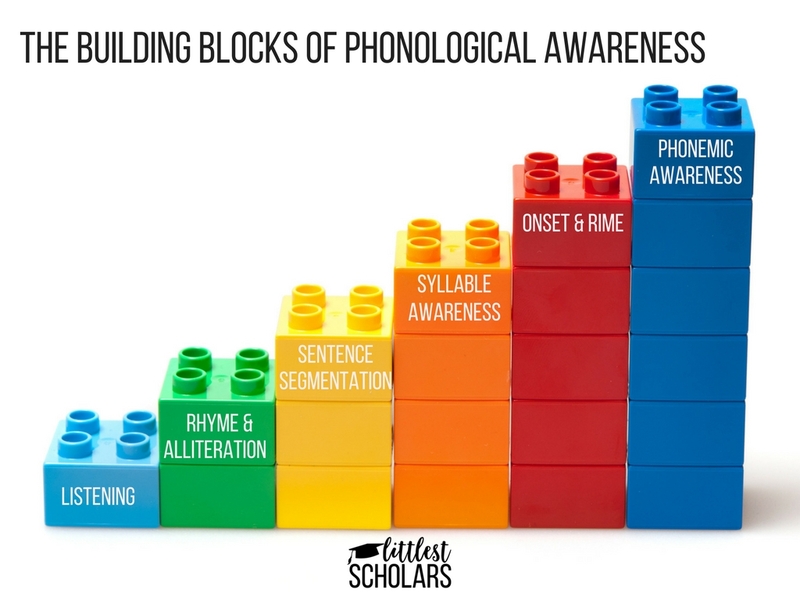 But because these skills develop along a continuum, we can't just start with phonemes (or individual sounds in words)! We must start at the beginning, ensuring children have a solid foundation in all phonological awareness skills. Now, let's talk about rhyme and alliteration. Rhyming is a complex skill and it is a skill that benefits from being constantly spiraled back to. It begins with your little scholars simply enjoying and imitating rhymes and moves on to recognizing rhymes, then finally producing rhymes. 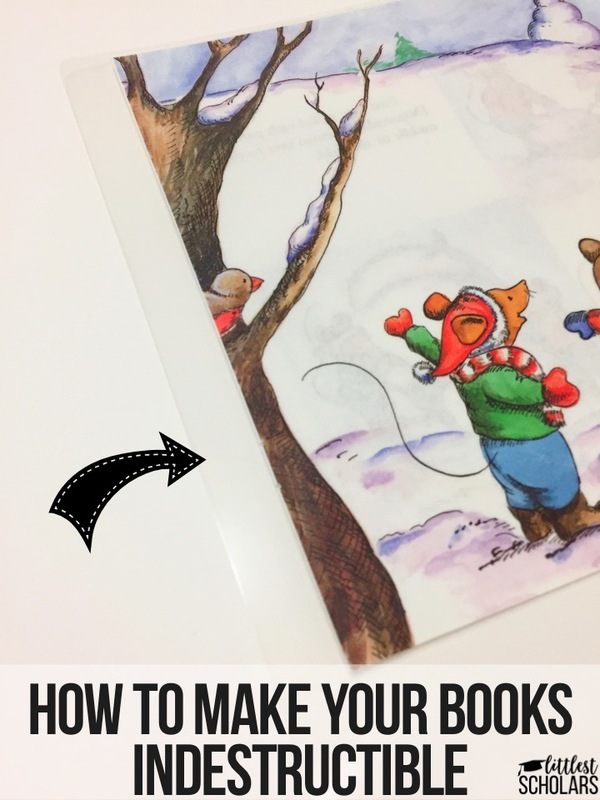 This is one of my favorite transition activities! All you need is a whiteboard, marker, and eraser. 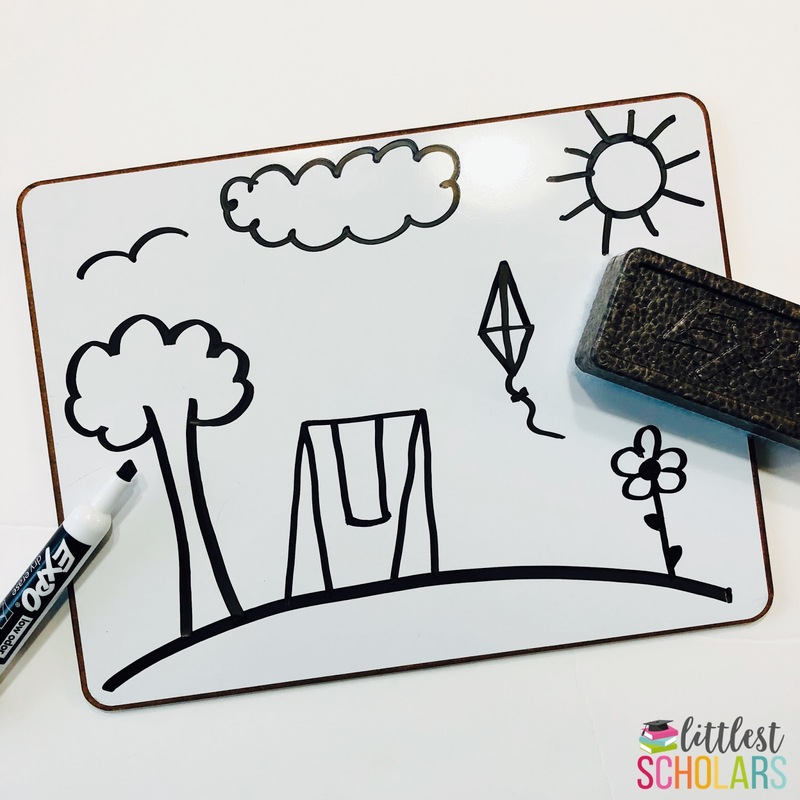 Draw a simple picture with objects that are easy to rhyme like a sun, boy, kite, tree, dog, star, etc. Say, "I rode to school in a car, so I need a friend to erase the _____." Invite a child who says "star" to erase the star from the picture. 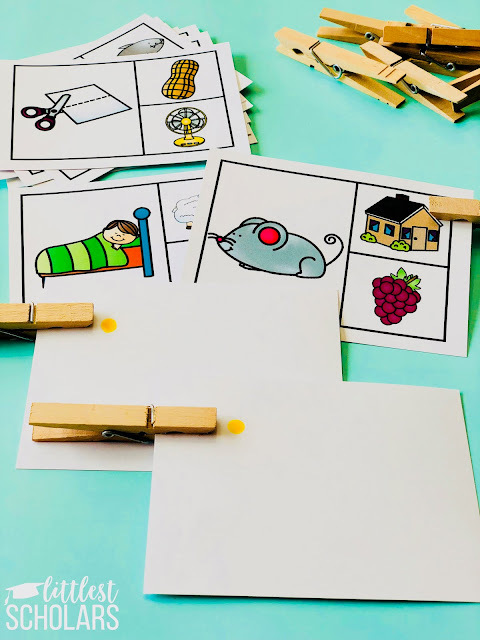 Rhyming can be a difficult skill for children, so the pictorial clues provide scaffolding to children. If you have a student who is struggling with rhyming, invite them to participate when there are only one or two pictures left to erase. This will differentiate this activity for them by limiting the possible choices while building their confidence! This activity allows children to practice recognizing rhymes and develop their fine motor skills at the same time. Children say the picture words and place a clothespin on the picture word that completes the rhyme. In the photo below you see these rhyming pairs: sleep-sheep, chair-bear, and shoe-glue. Whenever I can, I try to incorporate an element of self-check when my little scholars are working independently. I used a yellow marker to make a dot on the back of the card indicating the correct answer. 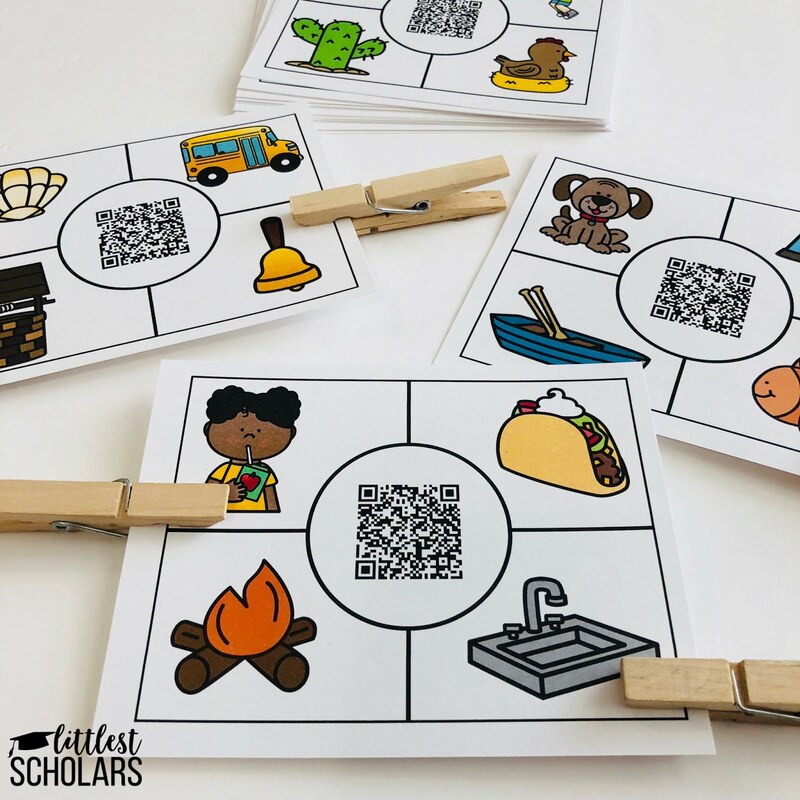 This helps them check their work ongoing instead of waiting until the end of centers or stations to find out they've done it wrong! You can find this activity here. Teaching using kinesthetic motions (or gestures as we call them in my class) is key! I use this chant with gestures to practice recognizing rhymes. "Cat, -at, -at, bat -at, -at. They sound the same at the end, they rhyme!" "Fan -an, -an, frog -og, -og. They don't sound the same at the end, they don't rhyme!" "Car, -ar, -ar, star -ar, -ar. They sound the same at the end, they rhyme!" I love this chant because it helps children really understand the part of the spoken word that makes the rhyme. 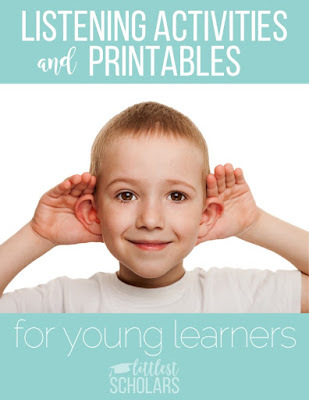 Plus, using hand motions helps them remember! Place three picture cards in a pocket chart, two of which rhyme. Name the picture words and ask your little scholars to flip over the card that doesn't rhyme. 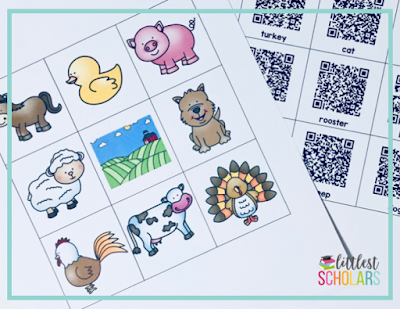 This activity incorporates technology as it encourages your little scholars to use listening skills as they identify words that rhyme. They scan the QR code, listen to the audio prompt (it's me giving them directions! 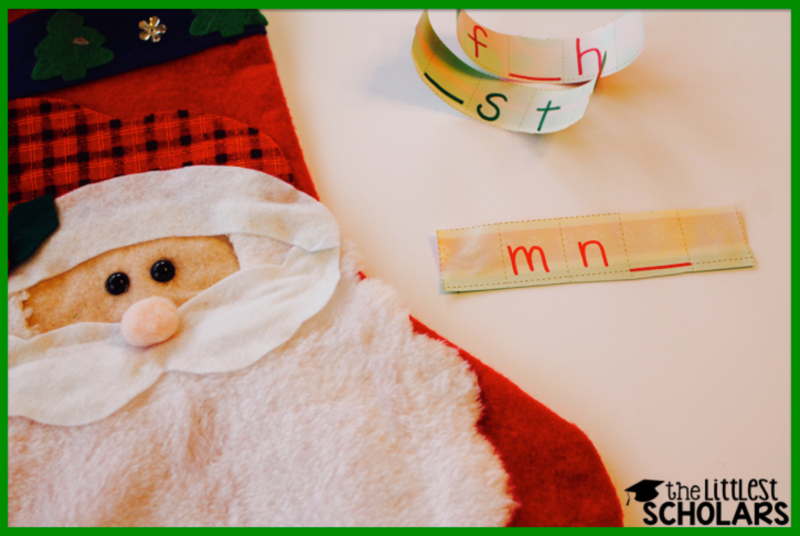 ), and place a clothespin or other manipulative on the picture word that rhymes. You can find this activity here. I say the same chant that I shared in the video above in the prompt on each card. Your little scholars will hear, "Can you identify the picture words that rhyme with wink? Wink, -ink, -ink. What rhymes with wink?" 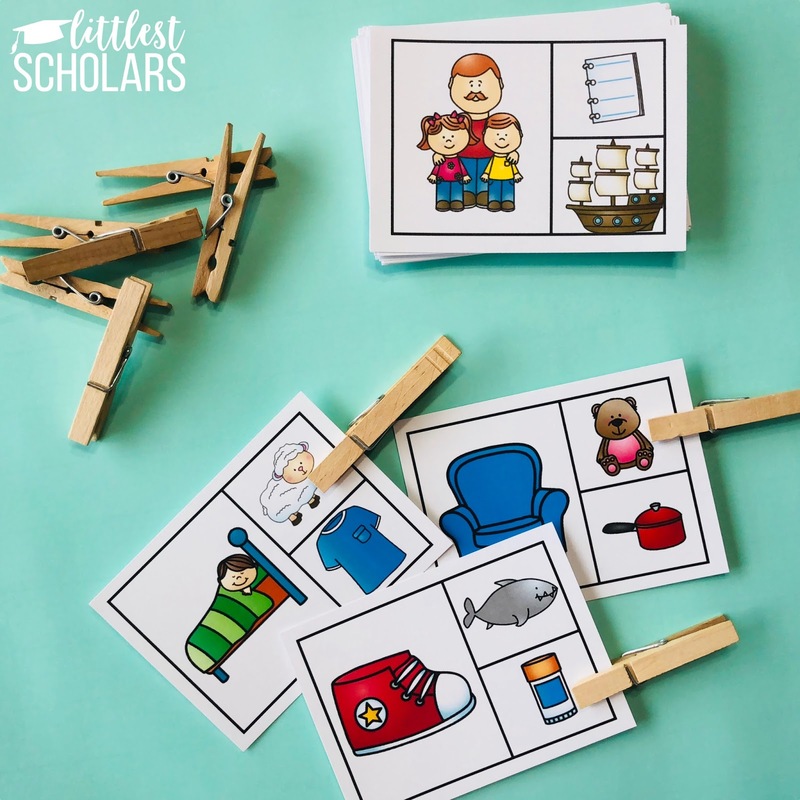 They'll place a clothespin or other manipulative on the picture words sink and drink. This activity is great because it provides lots of practice with the critical phonological skills of listening mixed and identifying rhymes. Mix up the way you assign partners in your class! Instead of peanut butter and jelly or ketchup and mustard, use rhyming words like sheep and jeep and dragon and wagon to assign partners. Hand each student a card and instruct them to partner up by finding someone who has a picture word that rhymes with theirs. There is no shortage of picture books with rhymes but below I've listed just a few of my favorites. Big brown bear and slithering sneaky snake. Those are both examples of alliteration, the repetition of words with the same beginning sound. 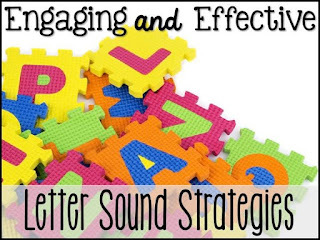 Alliteration is on the phonological awareness continuum of skills because as young children hear and notice words that begin with the same sound, they are also identifying and isolating phonemes. See what I did there? Even though not all the words in Same Sound Circles begin with the same letter they do begin with the same sound, so it's alliteration! Using paper plates or circles cut out of construction paper, glue a picture card on or above the circle. Provide children with a variety of picture cards to choose from. Children will name the picture cards and place it on the same sound circle. 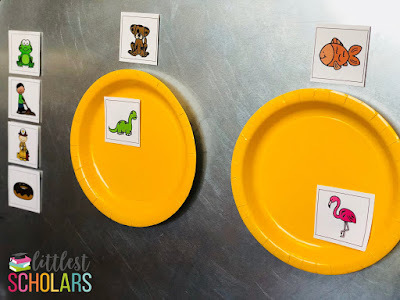 In the picture above, you see a paper plate for the picture words dog and dinosaur and another paper plate for the picture words fish and flamingo. Children will place the pictures lined on the left (frog, dig, firefighter, donut) on the paper plate that has other picture words with the same sound. Gather a variety of objects: household, classroom, clothing, etc. 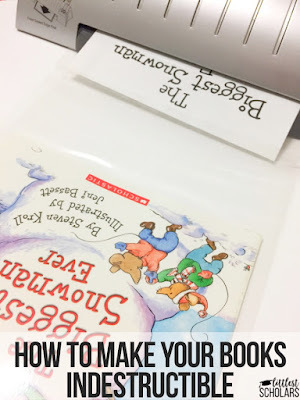 and place the items on the center of the rug or on a table in your classroom. Invite children to "spy" an item by giving them clues such as, "I spy an item that begins with the same sound as Paxton." Your little scholars would then identify the item that begins with /p/ just like Paxton's name. 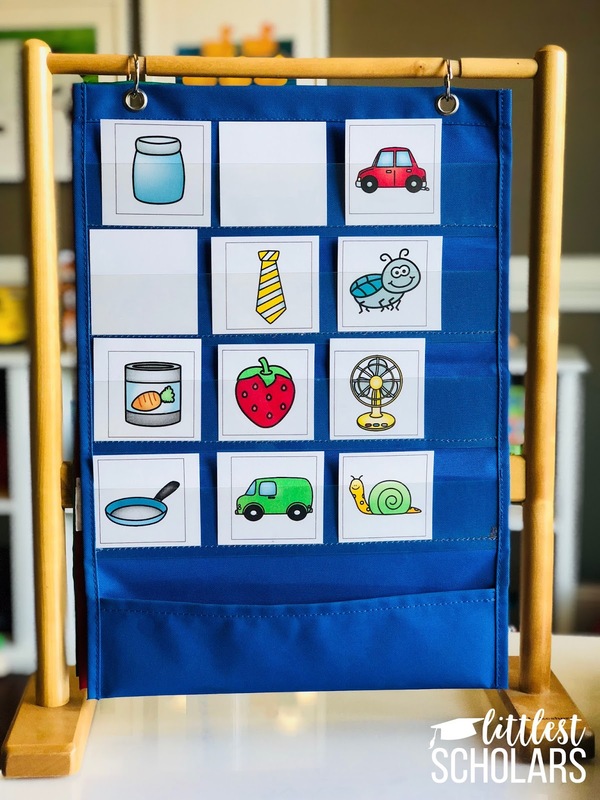 They'll love this activity because there are few things more exciting and relevant to young children than their own names! Create "new" names for your little scholars by adding an adjective before their names that begin with the same sound. Remember, it doesn't necessarily have to be the same letter! Examples are Adventurous Adam, Smiling Sophie, Cartwheeling Kaley, and Hilarious Jorge. The purpose is not to write these names down but to say them aloud so your little scholars hear and begin to notice the same sound at the beginning of each word in their "new" name. You can use these new names when calling on children or during transition times. 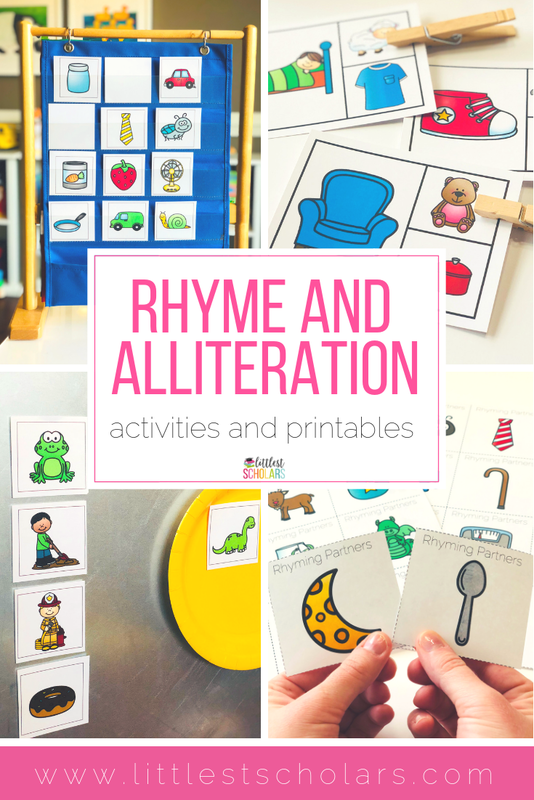 As they begin to understand the concept of alliteration, you can ask them to make up their own! Next up in this blog series I'll be diving into sentence segmentation. Until then, pin the image below to save or share this post. 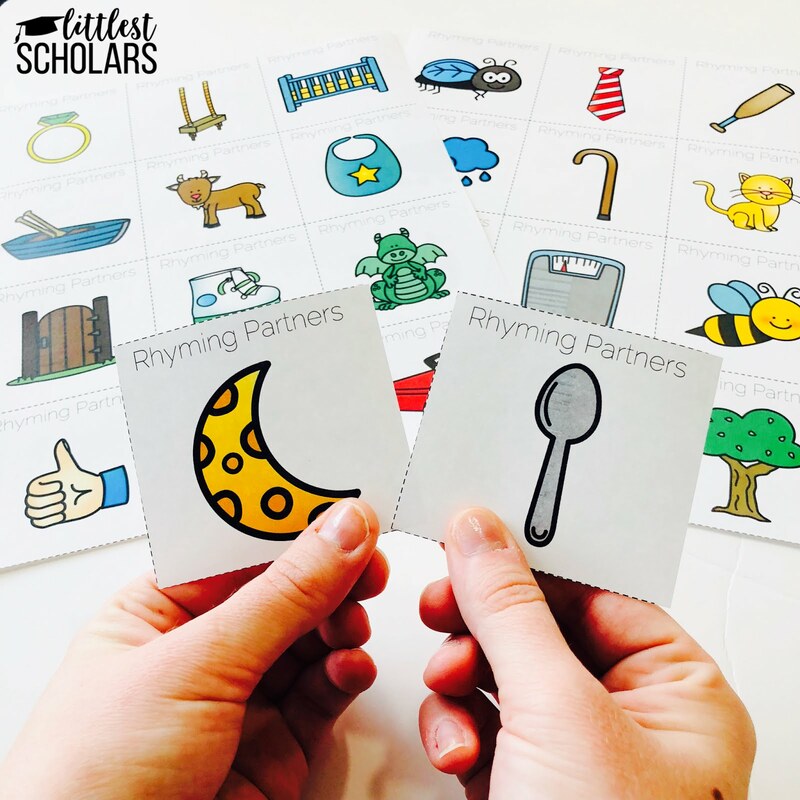 Want to try the Odd One Out, Rhyming Partners, and Same Sound Circles activities in your class? Drop your email address below to download the printables. 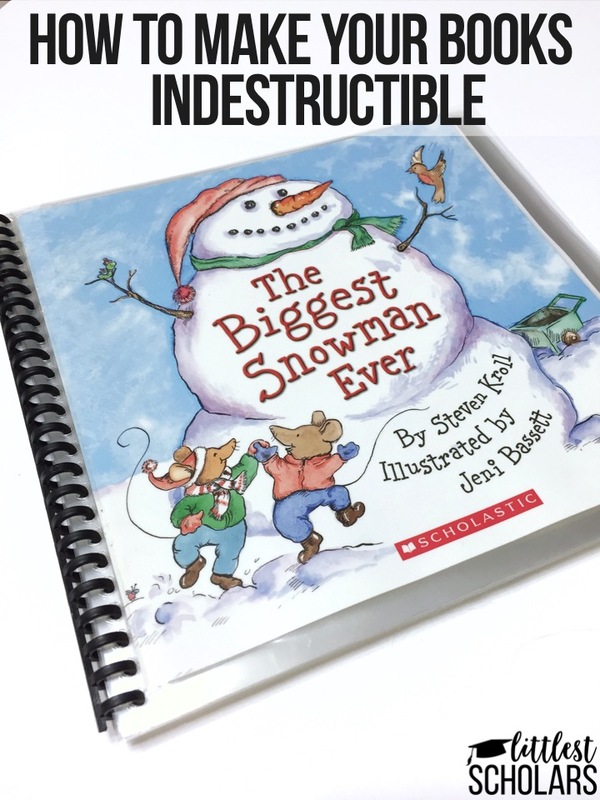 As teachers we know how critical reading to children is for their literacy development, but did you know that more than half of low-income families do not have children's books in their homes? One way we can help bring books into children's homes is establishing a lending library in our classrooms. 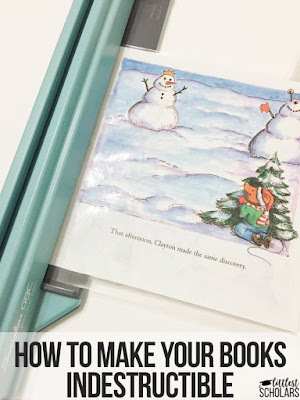 High quality books can be expensive to replace so I wanted to share a way to make the books in your lending library virtually indestructible--tear proof and easy to clean! 1. 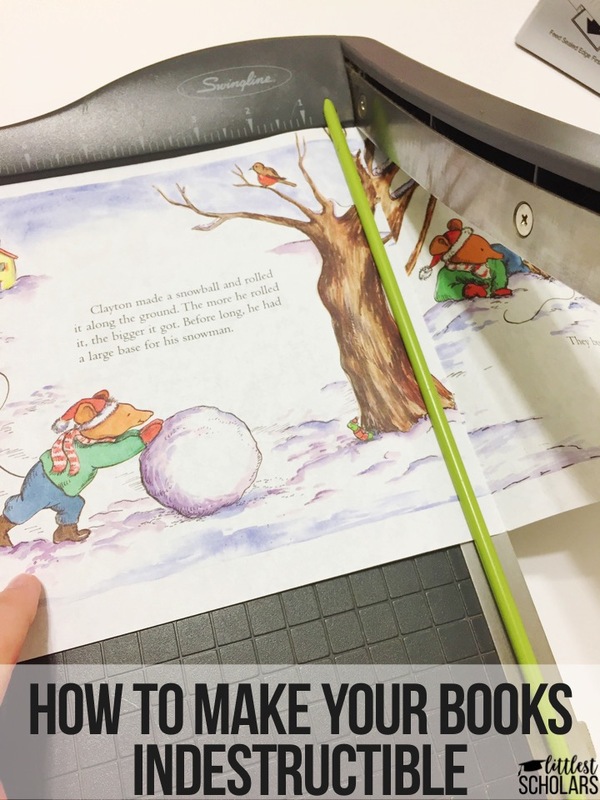 Disassemble the book by removing the staples on the spine. 2. 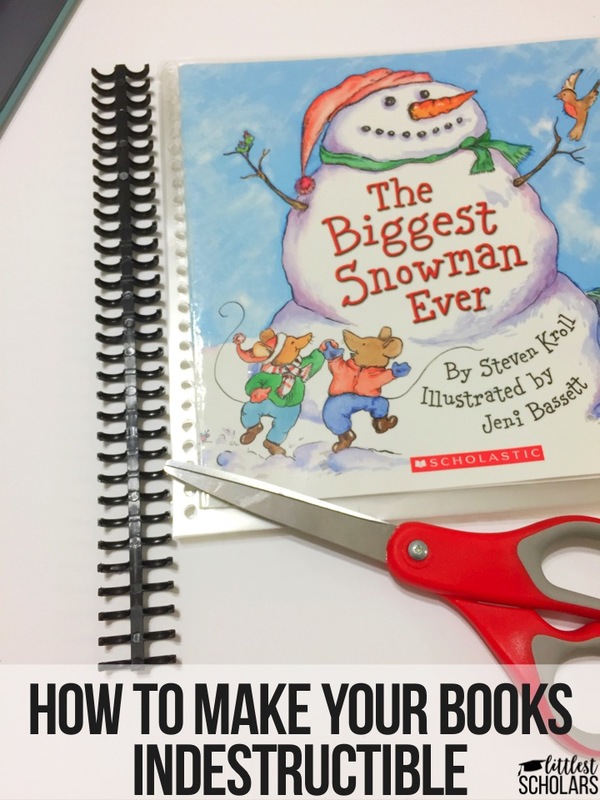 Cut the cover and pages in half. 4. Punch holes using a book binding machine or 3-hole punch. I purchased this binding machine several years ago and use it quite frequently! It comes in handy for projects like this. If you don't have a binding machine, binder rings and a 3-hole punch will work just as well! 6. 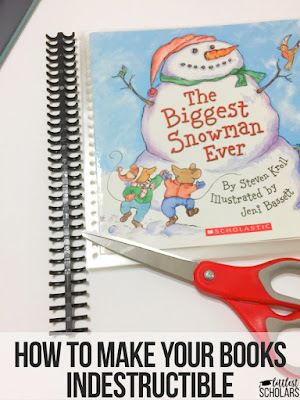 Bind the cover and pages. You can send home high-quality books without worry this way! Your little scholars will love having a rotation of books to read with their families. 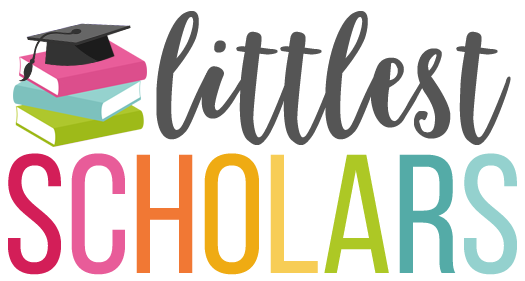 For more ideas, join us in the Teaching the Littlest Scholars Facebook group. 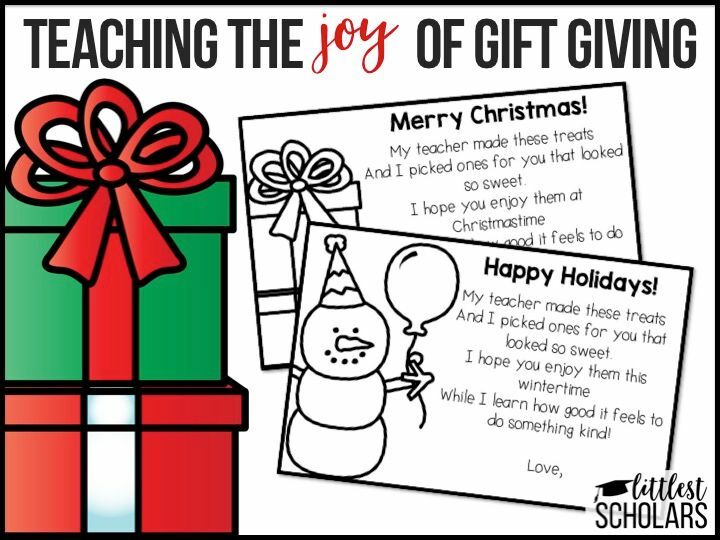 Teaching children about the joy one feels when giving gifts is sometimes hard to do! One of my favorite ways of spreading holiday cheer is by making candy coated pretzels. 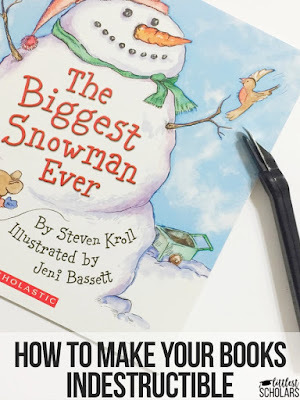 These are easy to prepare and let your little scholars experience for themselves how good it feels to do something kind for someone else during the holiday season. 1. Place parchment paper on a baking sheet or two depending on how many pretzels you are making. 2. Melt your candy coating per the directions on the packaging. I melt the candy coating in a deep bowl because it is much easier to dip them that way! 3. Dip the pretzels about 1/2 - 3/4 of the way into the candy coating and swirl off the excess candy coating. 4. Place the candy coated pretzel on the parchment paper and cover it with sprinkles before the candy coating hardens. I like to use a variety of fun holiday sprinkles! 5. After the baking sheet is full, place it in the freezer for 10-15 minutes to let the candy coating harden. 6. Remove pretzels from freezer. Schools have different policies on having and preparing food in the classroom so your little scholars may be able to help with all the steps. I prefer to make the pretzels at home and bring them in a big covered tray to school. I create a list of every adult in the school and assign a different teacher or support staff (or two) to each little scholar in my class. They then get to choose the pretzels for the teacher or support staff they will be giving them to and we put them in the plastic treat bags. My little scholars also pick the ribbon we use to tie the bag and they color and sign their own poems. Once we've got everything assembled, we head out to deliver the treats! We walk through the hallways and my little scholars personally deliver the treats. The teachers and support staff are so gracious and give my little scholars the biggest hugs! When we get back to the classroom we discuss how it makes our hearts feel happy to do something nice for others. Some children may not have the opportunity to buy or make a gift for someone else, so this is an experience they will not forget! You can download the poems [here]. I've included a Christmas poem and a winter themed poem so you can choose which suits your needs best! The holidays this year have come and gone, so pin an image from this post so you'll know where to find this next holiday season! Today I was wrapping presents and as much as I tried to measure the paper to fit the gift perfectly, I inevitably had to cut strips of the wrapping paper off to wrap them just right. I was cleaning up the table and this pile of wrapping paper strips was staring at me. I couldn't let this cute wrapping paper go to waste! 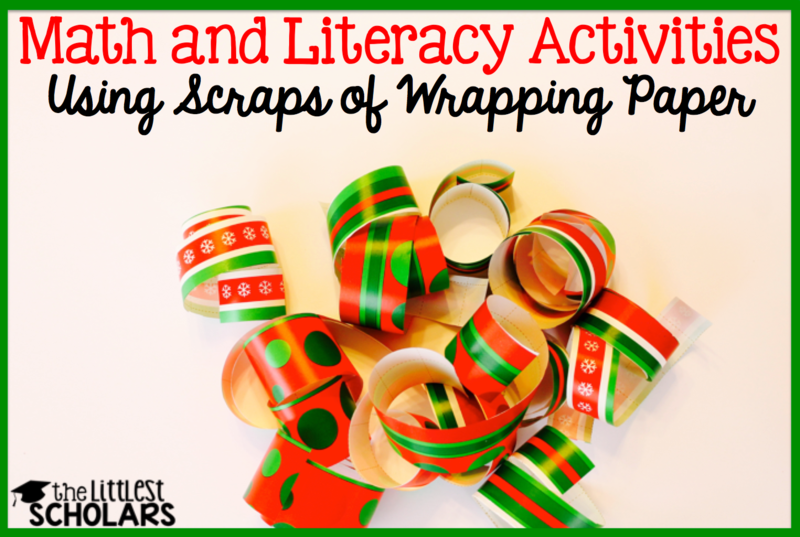 So I thought of a few fun literacy and math activities using scrap pieces of wrapping paper you have lying around. I wrote letters on these strips of wrapping paper to practice letter name and letter sound fluency. It's about that time of year for another round of DIBELS or AIMSweb assessments and this would make practice fun! 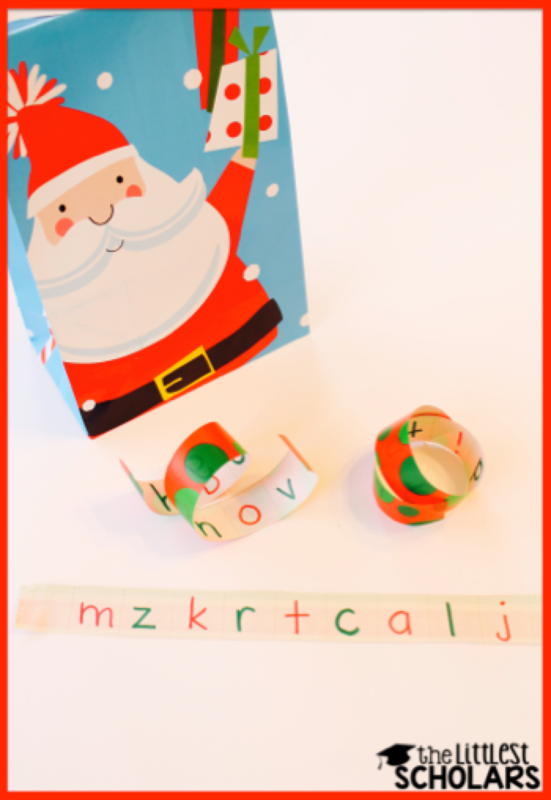 I wrote letters on several strips of paper and put them in the cute Santa bag. During small group, my little scholars can pull out a strip and say the letter names or letter sounds as quickly as they can. I wrote numbers on the scrap wrapping paper strips to practice number identification fluency. 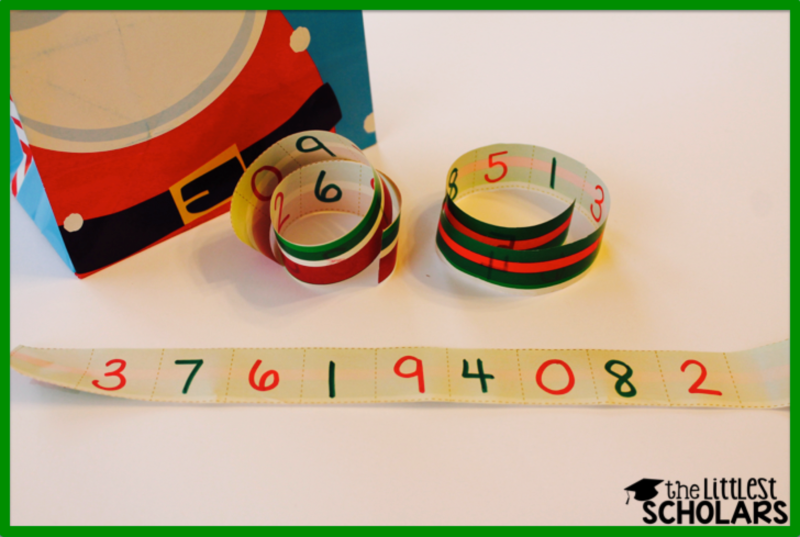 As a warm-up before small group math, my little scholars can choose a wrapping paper strip from the bag and identify the numbers as quickly as possible. I also wanted to use the scrap of wrapping paper to make a center my little scholars could do independently. I wrote a series of letters on each small strip with a missing letter. My little scholars will say the letters, identify the letter that is missing, and record the series of letters on the recording sheet. 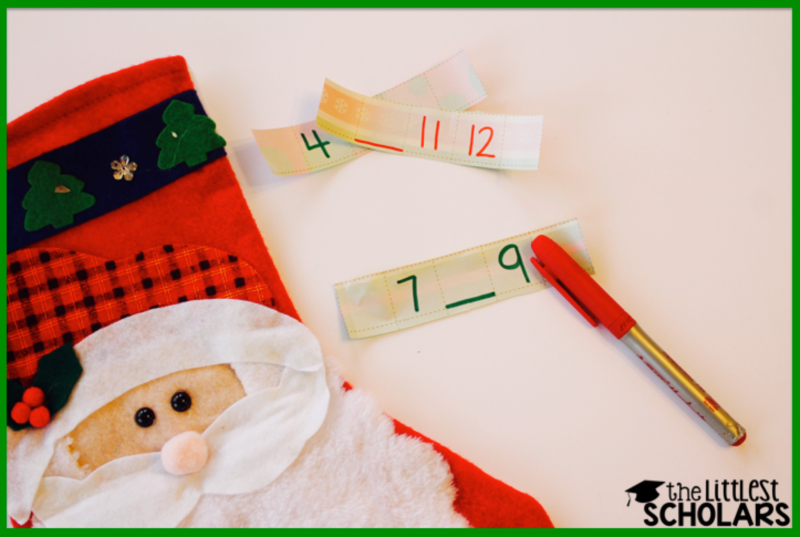 I placed the strips in a stocking for a little novelty--I know they'll love it! I did the same thing except using numbers for this next center idea. 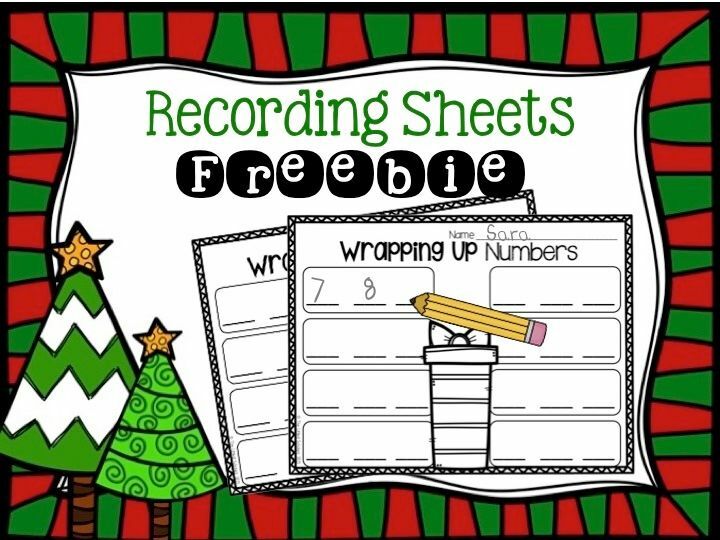 My little scholars will pull a wrapping paper strip out of the stocking, says the numbers, identify the number that is missing, and write the series of numbers on the recording sheet. I love including a recording sheet for accountability and you can download one to use by clicking the picture below.